As Ovid approaches the midpoint of Book 8 of his Metamorphoses, hence the middle of its fifteen books, he has just left Daedalus burying his son Icarus after their fantastic flight went wrong. Ovid then tells one of the greatest stories, of the Calydonian Boar Hunt. What is unusual about this account is that he tells it with wry, even dry, humour, which lightens its otherwise gruesome events. With the Minotaur dead, and Daedalus welcomed to Sicily, Theseus was sought to bring help to Calydon, which was being plagued by a monstrous wild boar, the vengeance of Diana. Calydon’s king Oeneus had paid oblations to most of the gods, but not to Diana, so incurring her wrath. Ovid provides a vivid description of the beast, as big as an ox, which Diana had unleashed on the city and its surrounding area, destroying crops and livestock. A long list of heroes were summoned to hunt the boar: Theseus brought Pirithous, Telamon the son of King Aeacus came, Meleager too from Calydon itself, and more than a dozen others. With them came a young woman, Atalanta, who was plainly dressed, and for whom Meleager took an immediate fancy. But the two sons of Thestius objected to this, and took Meleager’s gift from her. This enraged Meleager, who promptly killed them both with his sword. 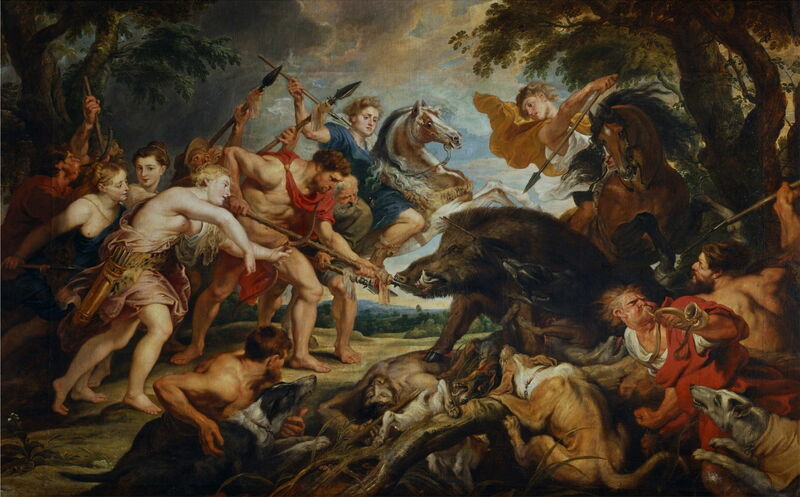 The Calydonian Boar Hunt is one of the great challenges of narrative painting, which was particularly popular with the seventeenth century masters, then almost vanished until the twentieth century. Some of its finest depictions, including that attributed to Veronese, are not currently available as usable images, but this selection should still tell Ovid’s story with brilliance. Nicolas Poussin (1594–1665), The Hunt of Meleager and Atalanta (Depart for the Hunt) (c 1634-39), oil on canvas, 160 x 360 cm, Museo Nacional del Prado, Madrid. Wikimedia Commons. The departure for the hunt is shown in The Hunt of Meleager and Atalanta (c 1634-39), which has been attributed to Nicolas Poussin, although that I think that is in great doubt. The procession of heroes, some on horseback, others on foot, makes its way out into the Calydonian countryside. Among them, it is easy to spot Atalanta, wearing a plain blue robe, holding her bow, and riding a white horse, towards the right. There are also two statues behind: on the right is Pan with his pipes, and in the centre is Diana, the cause of this problem, with the skull of a boar shown on the tree behind. Peter Paul Rubens (1577–1640), The Calydonian Boar Hunt (c 1611-12), oil on panel, 59.2 × 89.7 cm, J. Paul Getty Museum, Los Angeles, CA. Wikimedia Commons. Peter Paul Rubens and his workshop made several different versions. The first appears to have been The Calydonian Boar Hunt, in about 1611-12, which is now in the Getty. Here Meleager is just about to finish the wounded boar off. Atalanta’s arrow is visible by its left ear, and the body of Ancaeus lies just behind Meleager’s left foot. The wall of horses behind the boar, and the crowd of hunters behind Meleager – including Atalanta, dressed again in blue – frame the combatants in the foreground, with some spears directing the gaze at a visual centre of the boar’s snout. 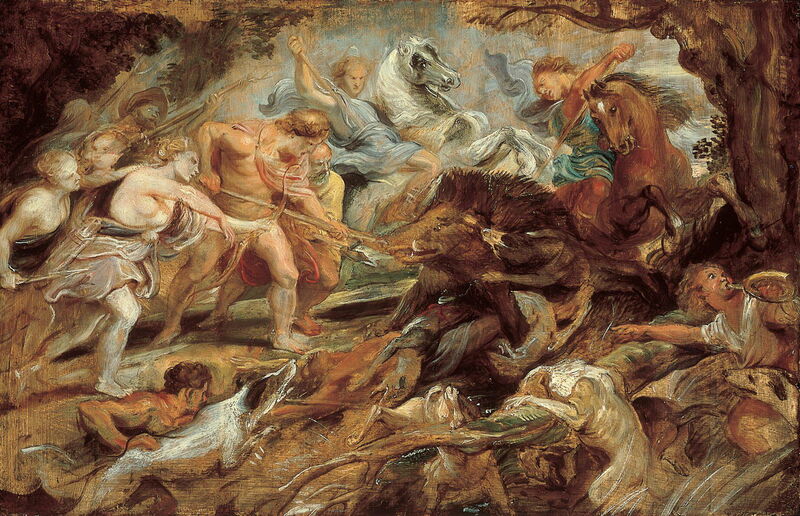 Peter Paul Rubens (1577–1640), Meleager and Atalanta and the Hunt of the Calydonian Boar (study) (c 1618-19), oil on panel, 47.6 × 74 cm, Norton Simon Museum, Pasadena, CA. Wikimedia Commons. 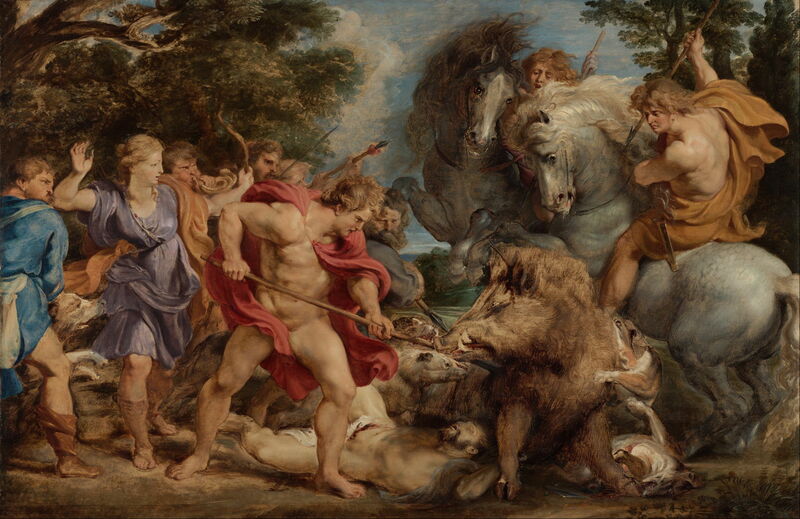 A few years later, in about 1618-19, Rubens reworked his composition in this marvellous study of Meleager and Atalanta and the Hunt of the Calydonian Boar. This shifts the visual centre close to the geometric centre, and brings the gaze in using a greater range of radials. It also gives Atalanta a more active part, as befits Ovid’s text. The finished result is The Hunt of Meleager and Atalanta probably from around 1618-20, and now in Vienna. Meleager has aged slightly, and the boar rests its hoof on the body of Ancaeus. Radial lines of spears are augmented by a dog and some human figures, and the centre of the painting now includes a landscape, with bright sky used to emphasise the visual centre. It also seems now to include not just Atalanta, shown at the right hand of Meleager, but two other women behind her, and possibly another in blue robes on a horse just above the middle of the painting. 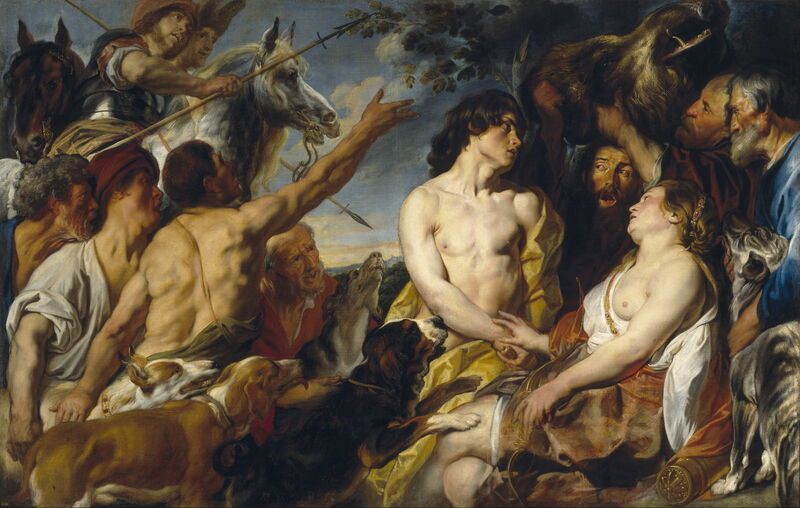 Jacob Jordaens (1593–1678), Meleager and Atalanta (1620-50), oil on canvas, 152.3 × 240.5 cm, Museo Nacional del Prado, Madrid. Wikimedia Commons. With the boar now dead, Jacob Jordaens shows Meleager and Atalanta (1620-50) allocating the best part of the prize, the boar’s head. This is raised high above the couple at the right. On the left, though, the two sons of Thestius look incredulous, and are just about to refute Meleager, and take the head from Atalanta. Peter Paul Rubens (1577–1640) and workshop, Meleager Presents Atalanta with the Head of the Calydonian Boar (before 1640), oil on panel, 76 x 57.5 cm, location not known. Wikimedia Commons. 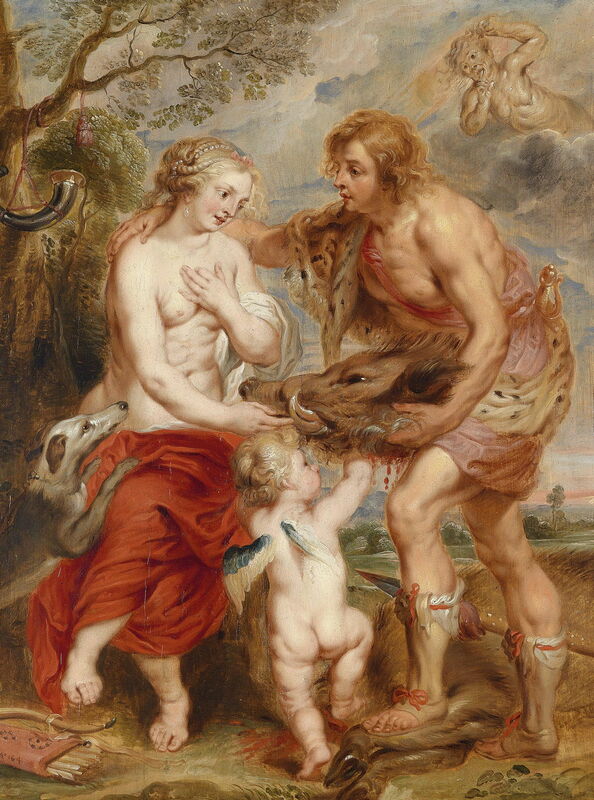 Rubens and his workshop’s Meleager Presents Atalanta with the Head of the Calydonian Boar (before 1640) prefers a more private award by Meleager. The couple are here alone, apart from an inevitable winged cupid, and a goddess (most probably Diana) watching from the heavens. Meleager stands on the forelegs of the dead boar, and his spear behind is still covered in its blood. This splendid, if unintended, series of paintings tells Ovid’s story almost to its finish, perhaps wisely stopping short of Meleager’s extremely vindictive murder of the sons of Thestius – an act which is the basis for the next myth in the Metamorphoses. Posted in General, Language, Life, Painting and tagged Calydonian Boar, Jordaens, Meleager, Metamorphoses, myth, narrative, Ovid, painting, Poussin, Rubens. Bookmark the permalink.